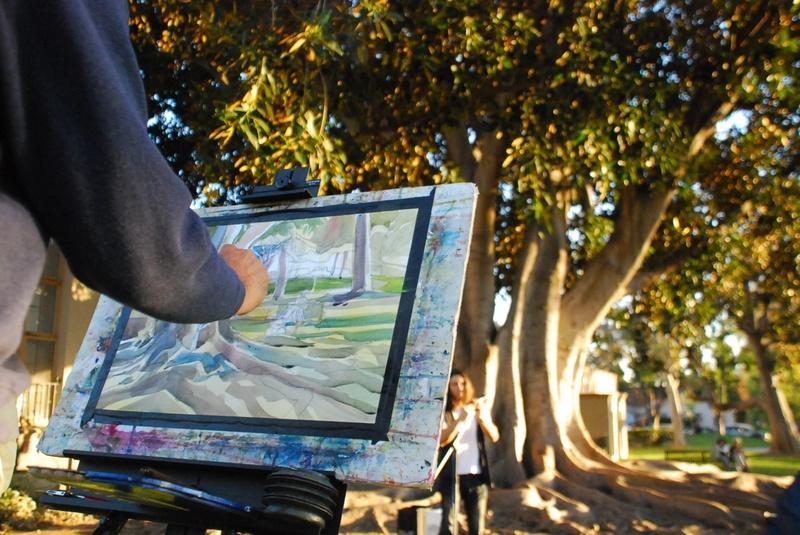 PHOTO: Eric Fabbro | SouthPasadenan.com | Famed artist Pete Morris painted the gigantic Moreton Bay Fig during Thursday’s program. 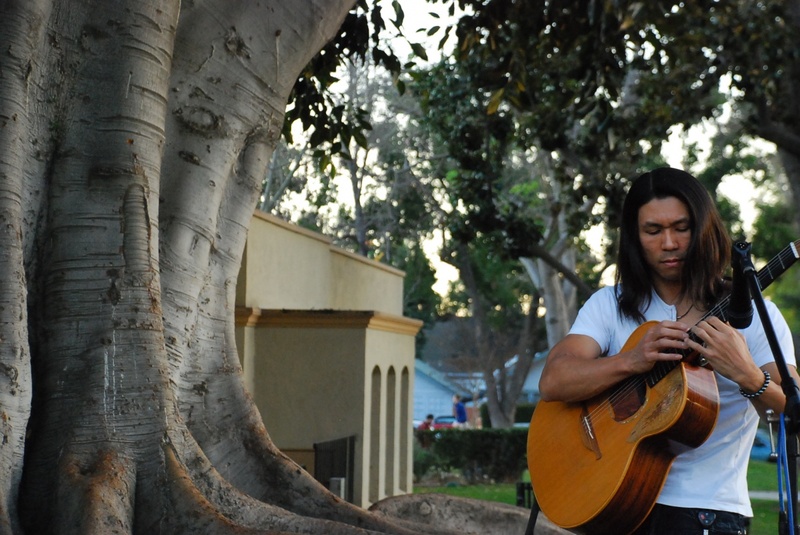 It’s simply known as the “The Library Tree,” a gigantic Moreton Bay Fig on the west side of the South Pasadena Library, yet its roots go deep – way, way deep – in terms of its significance to the local community. Make that 80 years deep, for at least one person in particular who knows its origin, and the man responsible for planting it. 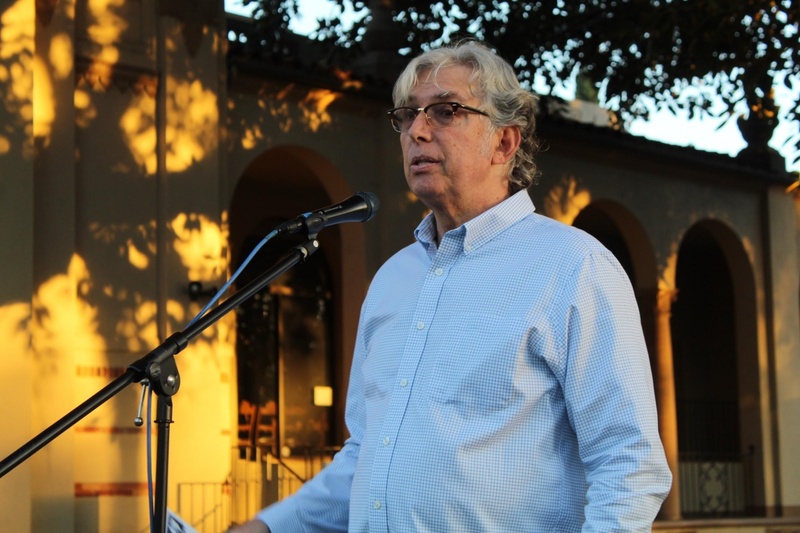 Bill Kloezman was among a group of speakers at a ceremony last Thursday afternoon celebrating the tree for being added to the city’s Historic Landmark Register last December by the South Pasadena City Council. 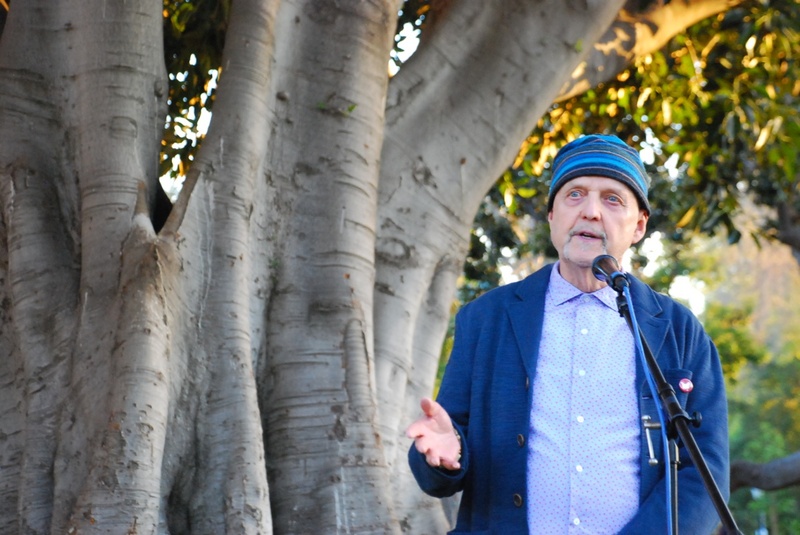 Prior to the start of the program, which included remarks made by the town’s mayor, Dr. Marina Khubesrian and a handful of other dignitaries, Kloezman was asked if he thought the towering fig would receive this kind of attention when he discovered his father, Wellem Kloezeman, had planted it about 80 years ago. 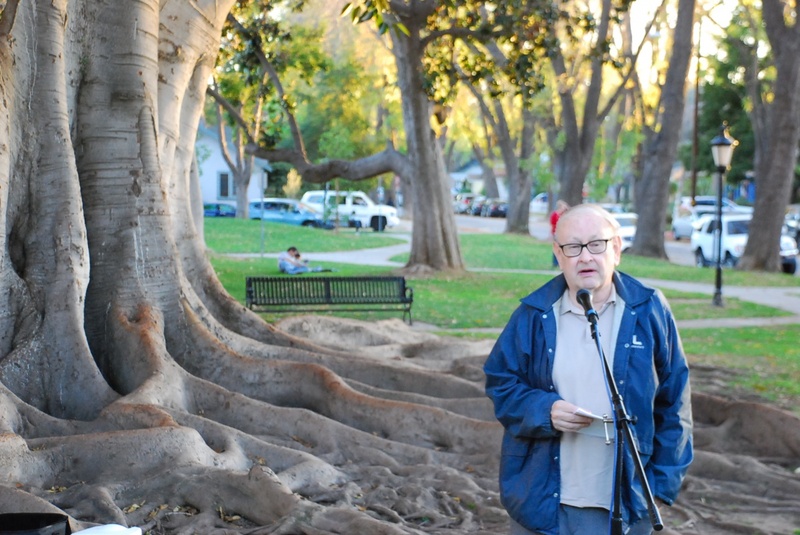 PHOTO: Bill Glazier | SouthPasadenan.com News | Bill Kloezeman talk about his father, the son of Willem, who planted the famed Moreton Bay Fig about 80 years ago. No longer is it just a tree. Today, it’s perhaps the most beloved in South Pasadena, gaining enormous status over the years, especially now as an official landmark. 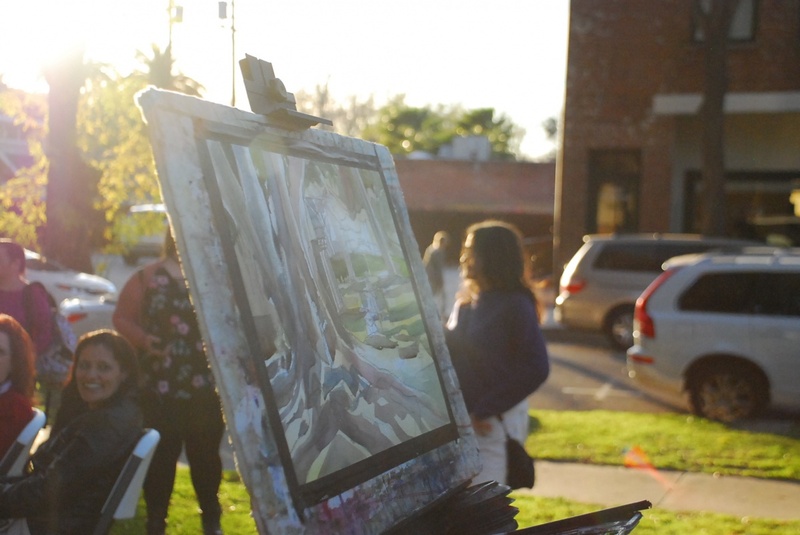 Willem Kloezeman, a former local city worker, responsible for putting it into the ground in 1930, had no idea it would someday bring so much joy to the community. Kloezeman has long passed away but not before leaving one of the City of South Pasadena’s most honored attractions, a tree cherished by the thousands who have walked and driven past it, and even played on it, evidenced by the number of kids romping around its sprawling roots on a daily basis. PHOTO: Bill Glazier | SouthPasadenan.com News | South Pasadena Library Director Steve Fjeldsted welcomed crowd to the celebration for the giant Moreton Bay Fig that was added to the Historic Landmark Register by the City Council. Working in South Pasadena all his life, the elder Kloezeman worked for the tree department from 1925 to 1940 before going to the local fire department until 1950, and finally to the water department to1972, ending a 47-year career, perhaps the longest in city history. 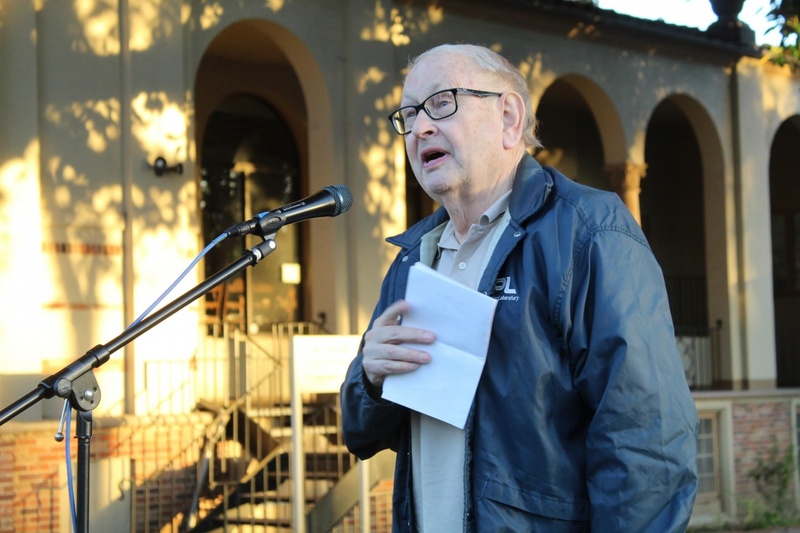 PHOTO: Eric Fabbro | SouthPasadenan.com | Steven Lawrence, president of the South Pasadena Preservation Foundation, remembers raising his family at their home by the tree. 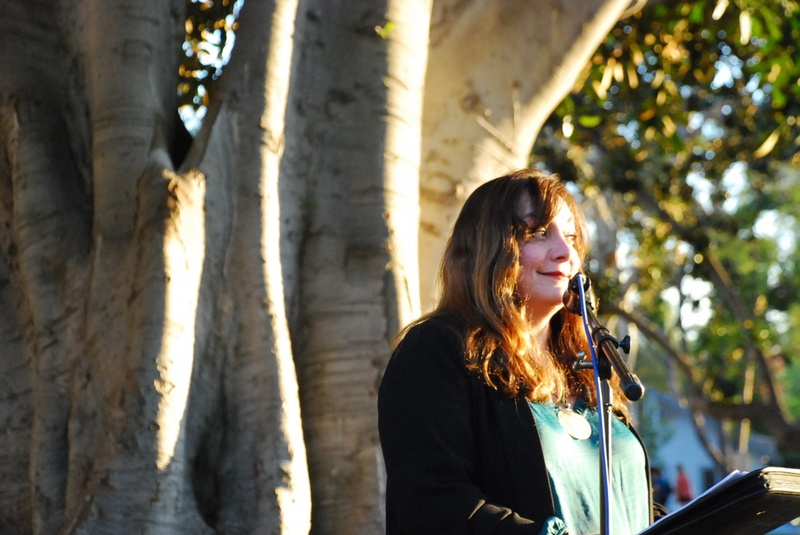 In her remarks, South Pasadena Mayor Dr. Marina Khubesrian called it “an amazing gorgeous tree,” referring to the Moreton Bay Fig, now known as Landmark No. 55 in the city’s historical archives. 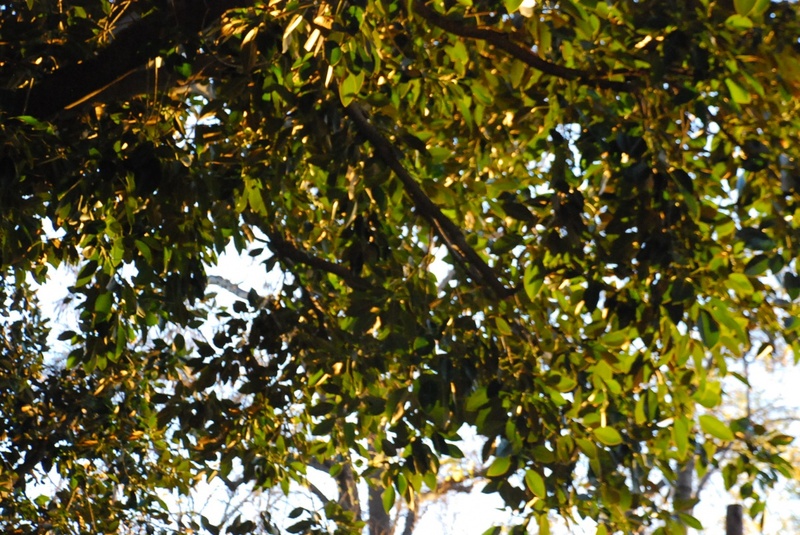 Other trees in the local registry include the Ashbourne-Chelten Hybrid Oak Tree, which died in 1988, the Cathedral Oak, now marked with a monument, and is also gone along the Arroyo, and a 200-year-old Clokey Oak currently in the backyard of a private residence on Laurel Street. PHOTO: Eric Fabbro | SouthPasadenan.com | South Pasadena Mayor Dr. Marina Khubesrain explained that the City of South Pasadena is widely recognized for its historic and preservationist nature. She says the city is committed to preserving its wonderful neighborhoods, significant landmarks and important cultural heritage. 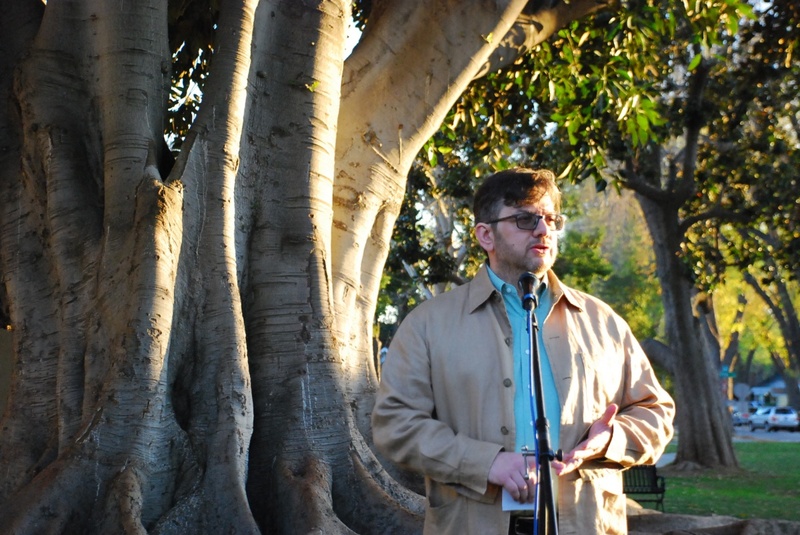 PHOTO: Eric Fabbro | SouthPasadenan.com | Mark Gallatin, chair of the Cultural Heritage Commission, talked about the importance of the Moreton Bay Fig tree in the community. 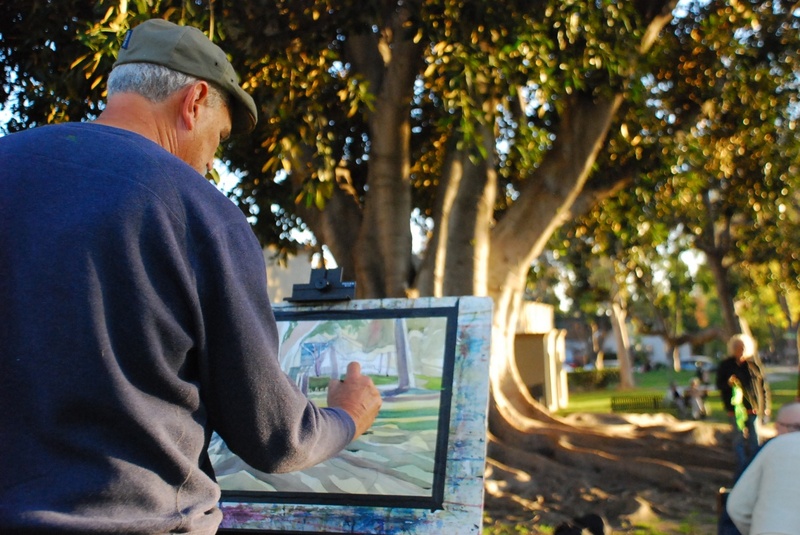 The City of South Pasadena remains committed to preserving its neighborhoods, significant landmarks and important cultural heritage. 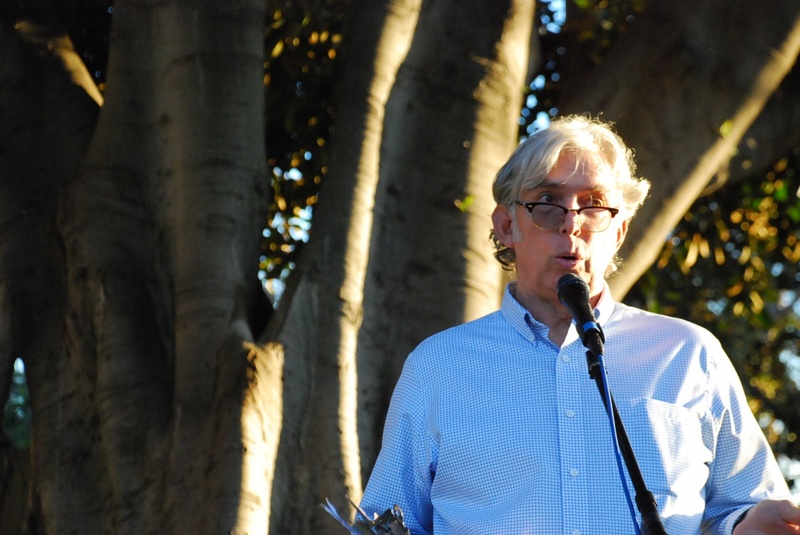 David Uwins, president of the Library Board of Trustees, thanked the City Council and responsible commissions and organizations, for making the tree a historic landmark, noting, like others, it has become a place for kids to frolic and families to picnic, especially on Thursday’s during the city’s farmers’ market. PHOTO: Bill Glazier | SouthPassadenan.com News | Among the speakers was David Uwins, president of the Library Board of Trustees. Spanning multiple generations, many people have wedding, baby and even first date pictures taken at the site. 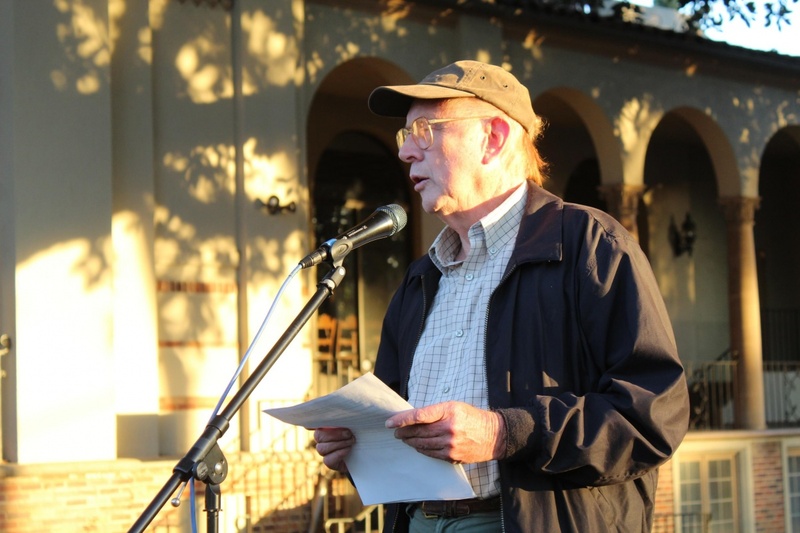 PHOTO: Eric Fabbro | SouthPasadenan.com | Poet Laureate Ron Koertge read a poem about the gigantic Moreton Bay Fig. “I think that I shall never see A poem lovely as a tree. 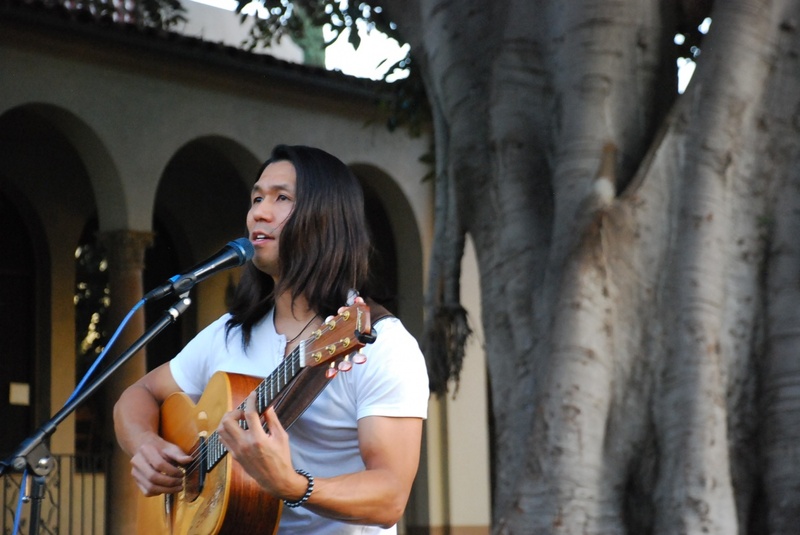 Singer Goh Kurosawa concluded the tree ceremony with an acoustic guitar performance while famed artist Pete Morris showcased his talents, with a painting of the tree that means so much to so many. PHOTO: Bill Glazier | SouthPasadenan.com News | Famed artist Pete Morris painted the gigantic Moreton Bay Fig during Thursday’s program. 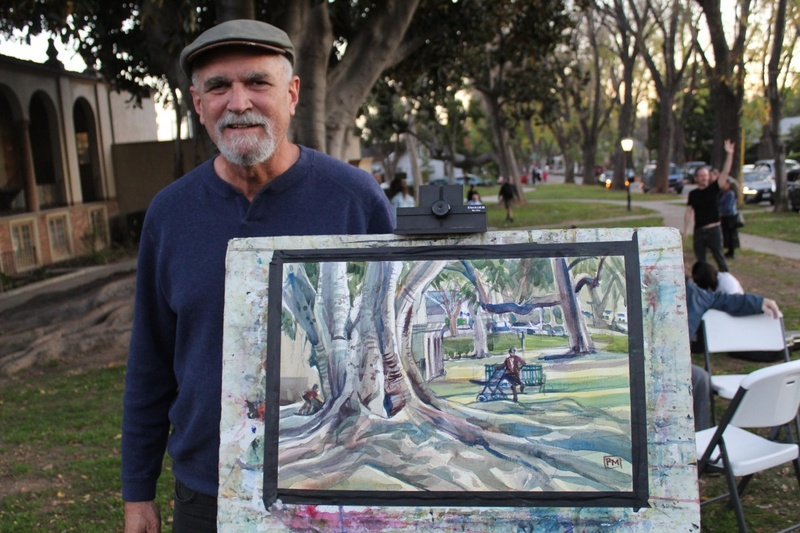 PHOTO: Eric Fabbro | SouthPasadenan.com | Bill Kloezeman talk about his father, the son of Willem, who planted the famed Moreton Bay Fig about 80 years ago. 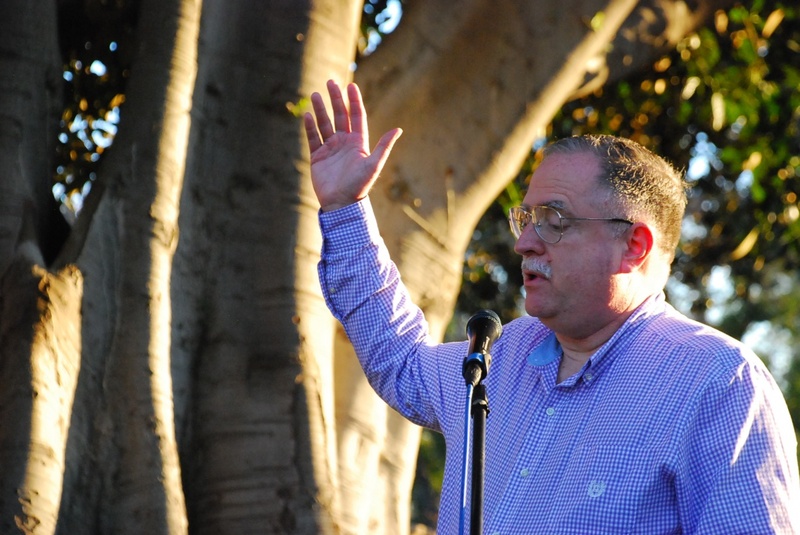 PHOTO: Eric Fabbro | SouthPasadenan.com | South Pasadena Library Director Steve Fjeldsted welcomed crowd to the celebration for the giant Moreton Bay Fig that was added to the Historic Landmark Register by the City Council.